It is with great sadness that we announce the passing of Raymond Franklin Teare on Friday, April 28, 2017 at the age of 82. He was a cherished husband, father, grandfather, uncle, nephew, cousin and friend. Ray is survived by his wife of almost 60 years, Vivian, his daughters Laurel (Cliff) Wale and Rhonda (John) Maskiewich, his grandchildren Jayman and Nolan McAllister, and Shae and Janna Wale, a special niece Tori (Keith) Christie, two brothers, Ralph (Lenore) Teare and Ken (Bev) Teare, sister-in-laws Ardell Teare and Connie Shupe, his aunt Hilda Shallbatter and numerous nieces , nephews and cousins. Ray was predeceased by his parents John and Evelyn Teare, brother Clayton Teare and sisters Wilma Venables and Thelma Zeigler. Ray was born in Vegreville Alberta on June 24, 1934, the second youngest of six siblings. He moved with his family to Oliver BC at the age of 14. Ray worked many jobs in his younger years including as an equipment operator and truck driver, and was employed for many years as a loader operator and concrete truck driver at Yellowhead Sand and Gravel/Concrete, and then BA Blacktop. At the age of 62, Ray retired and thoroughly enjoyed his retirement years. Ray was an avid gardener and an expert handyman at home and for his daughters, other family members and numerous friends. Ray was always ready and willing to help when anyone had a home or gardening project on the go. 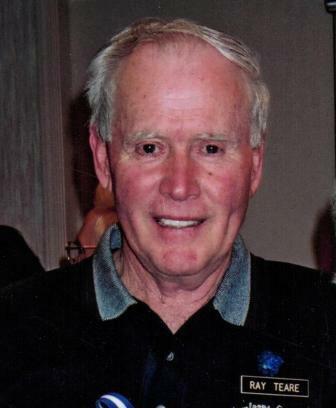 Ray was a lifelong softball player and also enjoyed golf, bowling, and curling. Ray was a true sportsman who enjoyed competition, as well as the social aspect of team sports. Always a gentleman when competing, he would offer words of encouragement to both team members and the competition. Ray coached his daughters and many other youth in bowling and softball, and was a dedicated fan of his girls in whatever sport they played. Ray and Vivian loved to camp and fish at nearby lakes, and in the last five years spent many days at Edith Lake. A Celebration of Life will be held at Summit Drive Church on Saturday, June 3rd, 2017 at 2:00 p.m with a tea to follow. The local Jumpstart Program (Canadian Tire Jumpstart Charities, 2180 Yonge St. Toronto, ON M4P 2V8) to help under privileged kids participate in sport. My deepest condolences to you all with the passing of your dear husband and father. I will always hold very fond memories of Mr. Teare as our softball coach – he was competitive but fair and always a class act. I truly regret not getting to spend a few minutes with him at mom’s service a couple of months ago. You were blessed with having him in your lives, cherish his memory always. So sorry and sad to hear of the loss of your husband and father. I remember seeing him at so many events over the years and he always had a warm and kind smile on his face. My thoughts and prayers are with you and your family at this time of great sadness. Mrs. Teare, Rhonda, Laurel & Families; I’m so sorry for your loss, I have thought about Mr. Teare many times remembering his awesome way of coaching on the ball field as well as at the bowling alley. His will be truly missed and his memory will live on with myself and many others he coached throughout the years! We were all so sorry to hear of Ray’s passing. I will always remember his warm smile and pleasant disposition. It seems like yesterday that he was coaching our softball team, always so happy and easy to learn from. I am thinking of you all and hope that your special memories will help you to get through this difficult time. Mrs. Teare, Rhonda, Laurel and families. We are so sad to hear of Ray’s passing, he is an exceptional man. Always happy to see us and share a couple of stories of golf, ball & curling etc. He genuinely was interested in what his friends were up to. Our thoughts and prayers are with all of you during this difficult. So sorry to hear of Ray’s passing. I curled with Ray for many years and enjoyed his calm determination when playing the game. Ray always had a smile regardless of the situation on or off the ice. We had many great discussions over a coffee about sports, his family and life in general.